Bernd Grimmel and Sebastian Hentsch are both dedicated devotees of Gospel music, and taken together, are a wealth of information about the scene in Germany, both now and over the decades. Hentsch sings with The Kitago Voices, based in Leipzig, Germany. Geographically, Gospel music is predominantly linked with The United States. But of course, the message of Jesus Christ is universal. This is our continuing series entitled Gospel Around The World. In this set of two articles, these co-authors explain the background of the popularity of Gospel music in Germany, tracing it to its earliest days many decades ago. The first article by Grimmel (below) describes the historical aspects of the genre in his homeland. The second article, co-authored by Grimmel and Hentsch (link here), details the current Gospel scene in Germany, and examines its influences. This double article is a part of our ongoing series titled Gospel Around The World. As a result of the Allied occupation of Germany during the Second World War in 1945, in the Western zones, the interest in jazz music increased, regaining its popularity since just before the Nazi era. In the 1950's, there were concert tours of jazz musicians, radio broadcasts and records available in the stores. Lippmann & Rau organized the first American Folk Blues Festival in 1962, influencing the whole European pop and beat music of the 1960's. German jazz fans always have been interested in the sources of their music, and the first books about Gospel music were published in the 1950's and early 1960's. The first recordings of Germans singing spirituals and Gospel songs were also released during this period. At the same time over in the States, the "jubilee quartet style" wasn't as popular as it had once been, so The Golden Gate Quartet decided to based themselves in Europe, in Paris. From there, they started regular concert tours all over Europe. Mahalia Jackson also travelled to Europe for concerts. 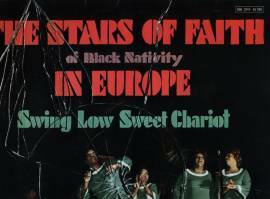 Langston Hughes' song play Black Nativity with Alex Bradford, Brother Joe May, Marion Williams & The Stars Of Faith and Princess Steward, toured Europe and Germany in the early 1060's. The play was broadcasted on German television in Christmas, 1964. Recordings of The Caravans, both Blind Boys groups, the Spirit Of Memphis Quartet, Sister Rosetta Tharpe, Rev. Samuel Kelsey, the Paramount Singers and others began to become available as well. Again, Lippmann & Rau took to the scene, and in 1965 started the American Spiritual And Gospel Festivals, presenting Rev. Kelsey, Inez Andrews, The Five Blind Boys Of Mississippi, The Harmonizing Four, The Gospelaires of Dayton/Ohio, Dorothy Norwood, the Mighty Clouds Of Harmony, The Robert Patterson Singers, Rev. Cleophus Robinson and Sister Josephine James. You could see these festivals on television, and records were produced. There were broadcasts on German radio stations with Gospel music at Christmas, Easter and Whitsuntide, and the American Forces Network (AFN) had a weekly program with Black Gospel music, all taking place in the 1960's and early 70's. 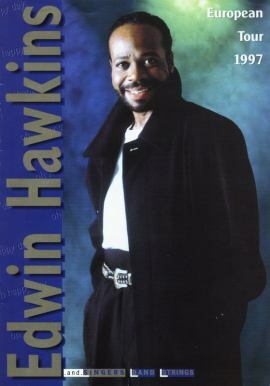 Then in the late 1960's, Edwin Hawkins' "Oh Happy Day" hit the charts in Germany, too. Consequently, the general interest in Gospel music increased. There was a broad offering of recordings at record stores in the 1970's. The Swiss promoter Willy Leiser started in the late 1970's to produce concert tours of the Brooklyn All Stars, The Barrett Sisters, Bessie Griffin, The Dixie Hummingbirds, The Blind Boys Of Alabama, Bill Moss and others, and many jazz festivals featured evenings of Black Gospel. In German cities and towns with American military bases, there has always has been a vibrant Black community life, with church services similar to what people were accustomed at home. But most Germans didn't know that. There was a Gospel music workshop with James Cleveland in the 1980's. American promoters brought over Shirley Caesar, Andrae Crouch and The Winans. The Jackson Singers, Americans of the Atterberry Chapel in Frankfurt were founded in 1983 and started touring smaller German towns. 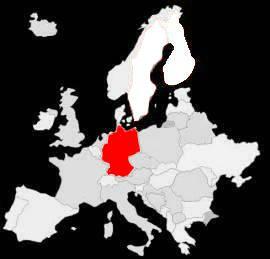 In doing so, they influenced the growing German Gospel choir movement. Link to the second article on German Gospel, which examines the influences on the genre. As a result of a low dollar exchange rate, many recordings were available in the 1980's. 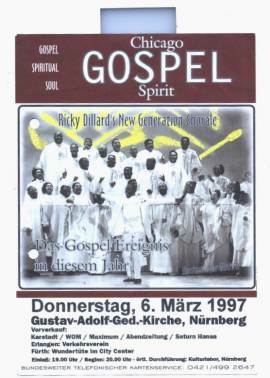 In the late 1980's, groups of Black American singers were organized to present "Gospel Shows", and these had a great influence on the German Gospel music movement, too. Those ensembles still tour Germany at Christmas time, but authentic groups such as the Mississippi Blind Boys, The Newberry Singers, The Brown Sisters, The Johnny Thompson Singers and Take 6 also usually come to Germany and to Europe in general. Today it isn't difficult to find Gospel albums, especially samplers with "old stuff"; in religious book stores they're offering contemporary Gospel CDs. In 1999 Teddy Doering published a book titled Gospel - Music Of Good News And Of Hope in Germany, with much valuable information about Gospel music. All content in GospelFlava � copyright 1997 - 2004. No information to be reprinted or re-broadcast from this site without the expressed written consent of GospelFlava.com. All rights reserved.